Are you looking for a useful merchandising product? Personalised towels could be really helpful for your business, restaurant or hotel. Personalised towels could be a good present for your clients, they will always be useful for every house and company. If you are the owner of a hotel or restaurant, these could be a perfect present to put in the bathroom. You could promote your brand with them and also get one level of distinction on the market. Towels are also an indispensable accessory for your bathroom, ideal as a birthday or Christmas gift. We have a big variety of towels in different sizes and colours. You can also benefit from different printing techniques that could help you to get the perfect towel. Explore your creative side and make your best designs. With our high-quality towels, you will surely make an impression. And the possibility of embroidery lets you express exactly what you want, whether it is ‘To the best boss in the world’, “Merry Christmas, love John & Jane’ or “May the Force be with you”. You cannot go wrong with a high quality embroidered towel. It’s easier than you think. Embroidery has a high-quality look, but in fact is reasonably priced. This printing technique is ideal if you’re looking for a stylish and durable solution. It is used a lot by our business clients who want to increase their brand awareness. An embroidered logo is excellent to use on staff uniforms and also on textile giveaways, such as towels. For hotels, using an embroidered logo on the bathroom towels is an additional opportunity for promotion. Combining the best towel fabric, such as Egyptian cotton, with your logo on it is the best way to be remembered by your customers. If you’re not sure how it will look like, you can order a sample from us. What can be a better kitchen accessory than a personalised tea towel? You can add anything on it, from a colourful print that matches your curtains to a stylish name embroidery. A nice quote on the towel hanging on the oven rail can cheer you up every morning. And why not using your tea towel as a cheat-sheet by printing your favourite recipe on it? No more wet and greasy old papers in your kitchen cupboards. Our range consists of woven cotton and 100% cotton tea towels. You also have a vast choice of colours, anything from white to pale peach. Our products are fully customisable so you can personalise the way you want. We also have an experienced team who can help you with the choice of design and printing technique that will suit best your needs. Forget the beach body, the only thing you need to impress is a personalised beach towel! Having a name print on it is a perfect way of being found on the crowded beaches, we’re sure your friends will appreciate that. Also, if you have already matched your swimwear with the bag colour, flip flops and hat why stop there? Have a matching beach towel too! Fashion is in the details. 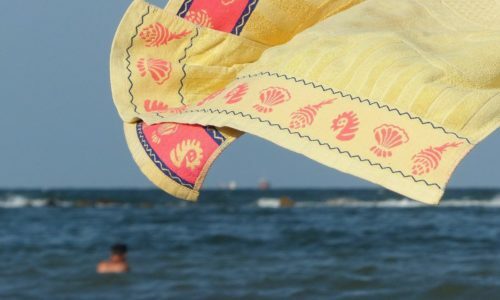 Our beach towels are both fully printable and very practical as they knitted from polyester – which allows you to customise them the way you want and cotton perfectly suitable to dry yourself. Is there anything cuter than a little baby all snuggled in a towel after a bath? Only a little baby all snuggled in a personalised towel. We’ve got all the printing techniques you might want to use to print your baby’s name or initials on the towel. The best ones we can recommend are embroidery, which will be very durable and Dye sublimation. The last technique can give a vibrant look to your print by dying the fibers with the graphic, whereas other printing methods try to apply an ink to the fabric which changes the feel and function of the material. If you want to have a full spa experience at your home, an embroidered bath towel is something you won’t want to miss. Paying attention to every small detail can transform a routine shower into a whole new experience that will help you to unwind and block out the sensory overload of an overscheduled modern lifestyle. For hotels and spas, the right choice of garment for the towel combined with embroidered logo can leave the best memories of the place, your customers’ will be striving to come back more often. With Garment Printing, you have a vast selection of towel fabrics. You can choose from Ringspun cotton, Microfabrics, and Egyptian cotton towels. We also have any possible colour you can think of, even the one that will perfectly match your brand image. If you’re an avid golf player, personalised golf towel can add a nice individual touch to your golf kit. You can print your name or add a unique design that will help you stand out on the course. You can use it either as a treat for yourself or as a gift for a loved one with a passion for golf. If sports is a big part of your life, then personalised gym towels are exactly what you need. For gym owner, printing the logo on the towels is a perfect opportunity to increase brand awareness. Have them as a giveaway for the most loyal clients, or during an event.